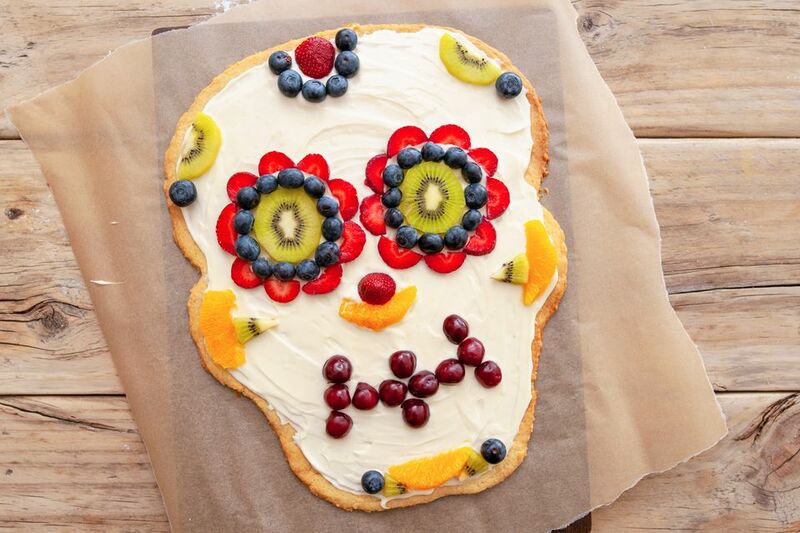 If you're sick of desserts covered in candy corn or in the shape of a witch hat, try out this unique Dia De Los Muertos sugar skull dessert pizza. It's beautiful, full of fruit and yogurt, and incredibly simple to make. Simply bake the easy sugar cookie base, spread on the cream cheese frosting and get to decorating! Follow the photo as a guide or get creative on your own. Use an assortment of fruit to achieve the designs. We incorporated oranges, pineapple, blueberries, raspberries, strawberries, and kiwi into our dessert pizza. It's truly fun for the whole family to make and enjoy. Note: while there are multiple steps to this recipe, this skull pizza is broken down into workable categories to help you better plan for preparation and cooking. Soften butter to room temperature and place it in a large bowl or the bowl of a stand mixer. Add the sugar and cream together on high speed. Add the vanilla and egg and beat until light and fluffy. Sift together the flour, baking powder, and salt. Alternate adding the flour mixture and milk to the butter mixture until they are completely incorporated. Scrape down the sides of the bowl and mix again if necessary. Remove the dough from the bowl and wrap the dough in plastic wrap. Flatten slightly after you have wrapped it, so that it resembles a flat, thick disk. Refrigerate for 2 hours or overnight. Roll out the dough on a piece of floured parchment paper. Roll into a large rectangle about 1/4 inch thick. Cut out the shape of the skull, taking up as much of the rectangle as possible. Remove the excess dough. Place the skull cookie onto a baking sheet, leaving the parchment paper underneath. Bake for 8 to 10 minutes or until very slightly golden on the edges and set in the middle. Add the softened cream cheese, yogurt, powdered sugar, and vanilla to a large mixing bowl, beat or whisk together until smooth and completely combined. Prepare the fruit. Cut the pineapple into small wedges, cut some of the raspberries in half lengthwise. Peel and cut the kiwi. Spread the cream cheese mixture over the cooled pizza. Using two kiwi slices as eyes, create decorations and patterns on the pizza to make it look like a skull. Use blueberries for the mouth and strawberries and oranges for the nose. Get creative!